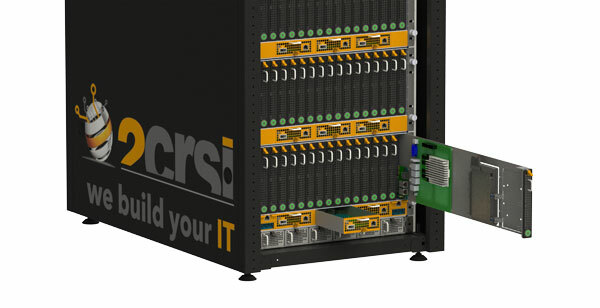 CHAPEL HILL, North Carolina – November 18, 2015 – This week, at Supercomputing 15 (SC 15) in Austin, Texas, custom server and storage manufacturer, 2CRSI unveiled its most flexible and upgradable high-density, full-rack solution—OpenBlade. The industry’s first hardware-agnostic blade server, OpenBlade is an essential tool for any company that wants maintenance friendly equipment that is optimized for CAPEX and OPEX. With a choice of up to 11 blades and 16 OpenU slots in each enclosure, OpenBlade is designed for compute, networking, storage, GP/GPU, IoT, hosting, and many other tasks. Larger fans reduce noise and vibration, cabling is reduced by up to 90%, and by designing for all access from the hot corridor, maintenance is easier and brings an extra layer of security. OpenBlade is water-cooling and immersion-cooling ready and its centralized power distribution reduces consumption by up to 50%. 2CRSI VP for US market, adds “typical usage can include web hosting with an enclosure of 16 web-oriented blades or HPC with GP/GPU dual Intel® Xeon® blades.” Feedback on the floor of SC15 has been overwhelming, from both customers and partners. 2CRSI has been designing and manufacturing customized storage and computer solutions for more than 10 years and has more than 500 customers across the globe. Founded in 2005 and with North American headquarters in SunnyValle, 2CRSI Corporation designs and manufactures storage systems, high-performance computing (HPC), and customized IT appliances. Their servers are designed and manufactured in France and the US. 2CRSI customers include data centers, independent software vendors, distributors, and other businesses with a need for high-quality, efficient, reliable storage and computing. 2CRSI also has offices in Strasbourg (France), and Dubai. For more information about 2CRSI, please visit: https://2crsi.com.